On Sept. 6, the National Weather Service noted that Flash Flood Watches are in effect over portions of Mississippi and Arkansas. The National Weather Service said that the threat of heavy rains and flooding will continue for several days. At 5 a.m. EDT (0900 UTC), Tropical Depression Gordon was located near latitude 33.7 degrees north and longitude 91.3 degrees west. The center was located about 115 miles (185 km) north-northwest of Jackson, Mississippi. The depression is moving toward the west-northwest near 8 mph (13 kph) and this motion is expected to continue today. Maximum sustained winds are near 25 mph (35 kph) with higher gusts. Little change in strength is forecast during the next 48 hours. The estimated minimum central pressure is 1015 millibars. 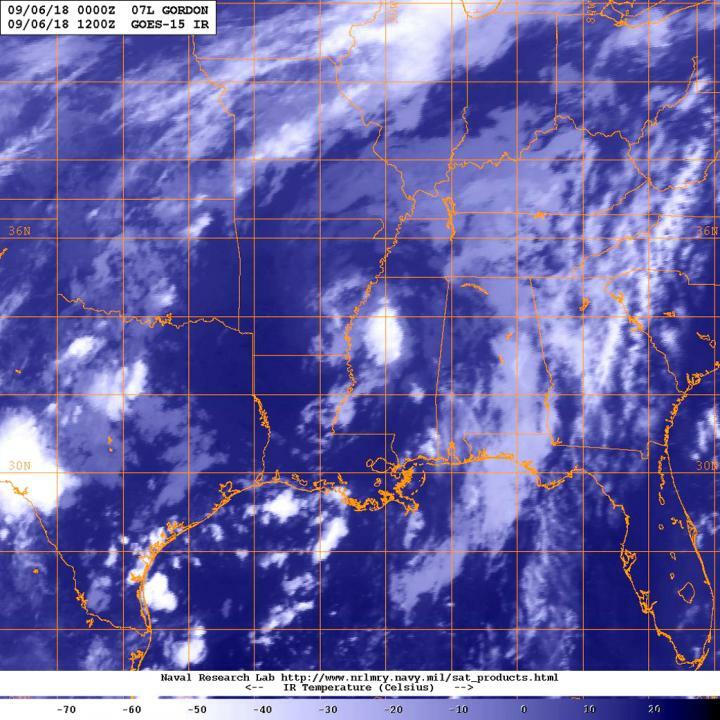 NOAA's GOES-East satellite captured an infrared image of Gordon on Sept. 6 at 8 a.m. EDT (1200 UTC) as it continued to move toward Arkansas. The image showed clouds in an egg-shape near the center of circulation. Gordon is expected to produce total rain accumulations of 3 to 7 inches over northwest Mississippi and much of Arkansas, up into the Midwest, with possible isolated maximum amounts of 10 inches through Saturday night. This rainfall will likely cause local flooding and flash flooding.